3 3. How are the following used? 4 4. Tell the points to be considered when making a garment fit properly and look tailored. 6 6. Know at least two methods for making bound buttonholes. Make a bound button hole using one of these methods. 7 7. Make a slit pocket with a welt or a bound pocket. 8 8. Demonstrate your skills in tailoring by making a man's or woman's suit that fits properly. The Tailoring Honor is a component of the Homemaker Master Award . The term wool is usually restricted to describing the fibrous protein derived from the specialized skin cells called follicles in sheep. Wool is taken from animals in the Caprinae family, principally sheep, but the hair of certain species of other mammals is also sometimes called "wool", including cashmere from goats, mohair from goats, vicuña, alpaca, and camel from animals in the camel family, and angora from rabbits. Wool has several qualities that distinguish it from hair or fur: it is crimped, it has a different texture or handle, it is elastic, and it grows in staples (clusters). Worsted (pronounced /ˈwʊstɨd/), is the name of a yarn, the cloth made from this yarn, and a yarn weight category. The name derives from the village of Worstead in the English county of Norfolk. This village became, along with North Walsham and Aylsham, a centre for the manufacture of yarn and cloth after weavers from Flanders arrived in Norfolk in the 12th century. Worsted cloth, archaically also known as stuff, is lightweight and has a coarse texture. The weave is usually twill or plain. Twilled fabrics such as whipcord, gabardine and serge are often made from worsted yarn. Worsted fabric made from wool has a natural recovery, meaning that it is resilient and quickly returns to its natural shape, but non-glossy worsted will shine with use or abrasion. Worsteds differ from woolens, in that the natural crimp of the wool fibre is removed in the process of spinning the yarn. In Tropical Worsteds this use of tightly-spun straightened wool combined with a looser weave permits the free flow of air through the fabric. Worsted is also used for carpets, garments, hosiery, gloves and baize. This a soft white fabric that is can be is a fibrous substance to plants around it. It is made into a textile fiber that can also be used for thread and sewing. Cotton is very soft and that is how cotton candy got it's name. The fiber in cotton is almost purely cellulose (cellulose- the main consistent of a plant wall). Linen is a soft fabric that is produced by weaving or knitting fiber fro textile. It is woven from flax. Flax is a blue plant that has textile fiber inside of it. Sheets and some clothing are made out of linen. The reason that linen is thin is because because of it's variable length. Plain or tabby weave is the most basic of the three fundamental types of textile weaves. It is strong and hardwearing, used for fashion and furnishing fabrics. In plain weave the warp and weft are aligned so that they form a simple criss-cross pattern. Each weft thread crosses the warp threads by going over one, then under the next, and so on. The next weft thread goes under the warp threads that its neighbor went over, and vice versa. 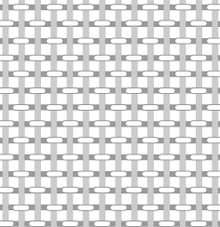 Plain weave is also known as "tabby weave" or "taffeta weave." Basketweave is a variation of plain weave in which two or more threads are bundled and then woven as one in the warp or weft, or both. Diagram of the structure of a balanced 3/1 twill textile. Twill is a type of fabric woven with a pattern of diagonal parallel ribs. It is made by passing the weft threads over one warp thread and then under two or more warp threads, over one and under two or more, and so on, with a "step" or offset between rows that creates the characteristic diagonal pattern. Because of this structure, twills generally drape well. Examples of twill fabric are chino, denim, gabardine, tweed and serge. A herringbone weave is made by passing the weft over two warp threads and under the next two. On the next pass the over-under pattern is offset by one so that the weft passes between two warp threads that the previous weft went over. Pile weave is a form of textile created by weaving. Pile fabrics used to be made on traditional hand weaving machines. The warp ends that are used for the formation of the pile are woven over metal rods or wires that are inserted in the shed (gap caused by raising alternate threads) during weaving. The pile ends lie in loops over the inserted rods. When a rod is extracted the pile ends remain as loops on top of the base fabric. The pile ends laying over the rod may be left as 'loop pile', or cut to form 'cut pile' or velvet. 3. How are the following used? 4. Tell the points to be considered when making a garment fit properly and look tailored. 6. Know at least two methods for making bound buttonholes. Make a bound button hole using one of these methods. 7. Make a slit pocket with a welt or a bound pocket. 8. Demonstrate your skills in tailoring by making a man's or woman's suit that fits properly. This page was last edited on 27 February 2018, at 12:00.